Teppanyaki Steak, Chicken, and Vegetables. Welcome to Part 2 of The Beginner’s Guide to Meal Prep. If you haven’t read Part 1, you can click anywhere on this sentence to be taken there. In Part 2 I want to discuss topics including food storage tips and safety. Hopefully the information in this post will provide you the information you need to help preserve your meals and keep you on the path to success. 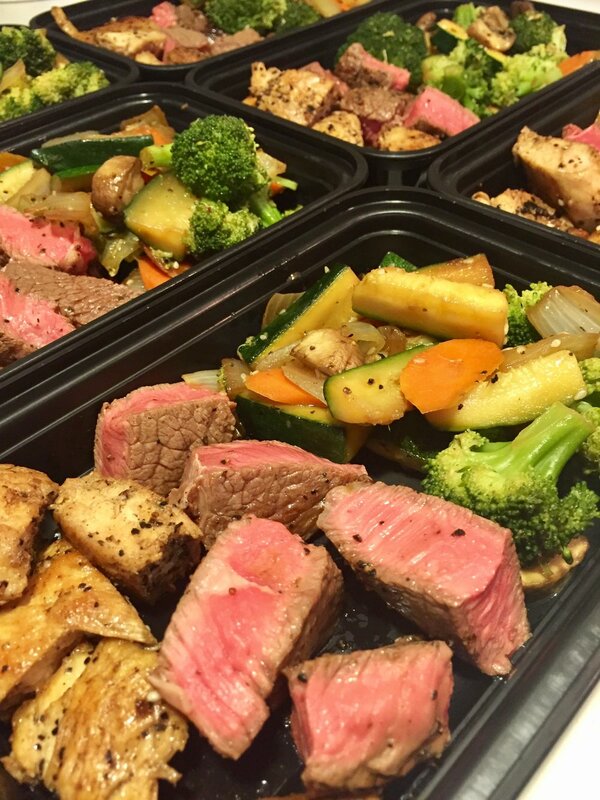 Meal prepping provides us with an abundance of home cooked meals all within the confines of our refrigerator. Meal prepping is convenient and economical when done correctly but there are certain factors we must consider when it comes to storing our food. If we are going to invest our time in preparing a large amount of meals, then we don’t want it to go to waste because of careless storage procedures. There are a number of steps we can take to ensure that our food stays fresh and safe for us to consume before we get the chance to eat it throughout the week. 1. Try and buy meats and dairy products with the “sell by date” farthest in the future. I’m sure you are aware that all perishable items we buy in the grocery store are stamped with a sell by/use by/expiration date. Meat and dairy products are stamped with a sell by date in which the store must remove them from the shelves if it has not sold yet. The sell by date allows for a reasonable time for the product to be used once it has purchased. Buying meat and dairy products that have sell by dates farther in the future will give you a little extra time to ensure that your food is as fresh and safe as can be. 2. Ensure that the temperature in your refrigerator is set below 40° F (4.4° C). The Danger Zone for bacteria growth is defined as being temperatures between 40°-140° F (4.4°-60°C). It is important that your refrigerator is set below 40° to help mitigate the growth of bacteria. Bacteria are able to thrive in environments where it has a food source, optimal temperature, and moisture. If you live in a warmer climate it may be necessary to place a thermometer inside of your refrigerator to ensure that it doesn’t get too warm. Try and keep the door closed as much as possible and store your meals in a place where they are least likely to be bothered. It may be helpful to designate a shelf or two in your fridge specifically for your meals. Don’t put your meals in the door as this is often the portion of the fridge where temperature fluctuates the most because it is exposed to outside air. 3. Let your meals cool to room temperature before you cover and store them. If you put a lid on the food while it is still hot, you will create steam inside of your storage container. This is undesirable for two reasons, you will continue to cook your food and you will create additional moisture inside of your container. Covering your food too soon and creating steam can lead to overcooked meat leaving it dry and rubbery as well as overcooked vegetables leaving them soft and mushy. Creating the additional moisture inside of the container is not wanted because it adds an extra variable in which bacteria are more likely to thrive. As a meal prepper you will have a lot of raw meats and vegetables in your fridge at the same time. Raw chicken is especially notorious for having leaky packaging. You do not want to store your fresh vegetables or your prepared meals somewhere that has been exposed to raw chicken fluid. Cross contamination does happen and salmonella will destroy your digestive organs. Try and keep your meats wrapped in plastic bags before you use them to decrease the chance of cross contamination. If you do find a spill in your fridge, clean the surface with hot soapy water and then rinse. Foodsafety.gov recommends only storing leftovers in your fridge for 3-4 days or in your freezer for 4-6 months. I personally prep for 5 days and don’t have any issue but proceed at your own discretion. It may appropriate to store some of your prepared meals in the freezer if you don’t plan on eating them in 3-4 days and transferring them to the fridge when necessary. It should be noted that some uncooked rice can contain a bacteria called Bacillus Cereus. If the infected rice is allowed to cool slowly (usually over the course of a few hours) it can produce spores and cause digestional trouble if consumed. One way to combat this is to store your rice separately from your other food so you can cool it instantly and not steam your other food. The Meal Prep Manual eBook contains 30 recipes specifically designed for meal prepping. Each recipe has calorie counts and macronutrient values already calculated, the hard part is done for you! 6. Good quality storage containers will help keep food fresh longer. I would recommend glass storage containers to anyone who can afford them. They are quite a bit more expensive but they will last longer, have a tighter seal, and you don’t have to worry about BPAs. The Pyrex brand is what I prefer. You can achieve an air-tight seal more easily with glass when compared to plastic. This will help prevent moisture or other odors inside your fridge from getting in. A popular topic of question among meal preppers is about freezing their prepared meals. When done correctly and with enough space, freezing may allow you to cook as little as once a month. Freezing meals is undoubtedly convenient, however it is likely to change the composition of the food. Foods like lettuce, melons, and gelatins do not work well in the freezer. Some foods freeze better than others and the quality of the food doesn’t diminish by a measurable amount. When considering freezing meals you have to determine whether you value convenience or food quality more. If you are someone who is okay with a small decrease in the flavor and consistency of your food then freezing your meals is an option for you. If you don’t mind spending a few extra days a month cooking then you are probably best prepping your meals for 5-7 days and avoiding the freezer. If you decide to freeze your meals there are few guidelines you can follow to help preserve as much freshness as possible. 1. Use high quality, air-tight containers. Freezer burn will render your meals inedible and thus a waste of money and time. To prevent freezer burn you must create an air-tight seal and inhibit moisture from entering your container. One way I like to add an extra layer of protection is by wrapping each of my containers in freezer plastic wrap. 2. Label every meal with the date it was cooked and what it is. After you wrap it in freezer plastic wrap it may become hard to see what’s inside and labeling it will prevent you from having to crack the seal and risk spoiling the food. 3. Don’t block the cooling source. If you prep a large amount of meals to be frozen your freezer will fill up quickly. It is very important that you do not block where the cold air is released into the freezer. This will inhibit the coolant system to reach the entire freezer and could create temperatures too warm to allow the meals to stay frozen. 4. Keep your freezer at 0° F (-18° C) or below. Microwaving is the clear favorite when it comes to reheating your meals. You can also use your oven, toaster oven, stove top, etc. The microwave will be the quickest and most convenient way. I recommend microwaving your food in one minute intervals. Heat for one minute, stir, and then test. After two minutes decrease the interval to 30 seconds and test. If you find that your food has poor taste after microwaving, experiment with changing the power level on your microwave to 60-80%. It will take longer for your food to cook but you may find that it makes the food more enjoyable. If you have meals in your freezer that you want to eat, defrost them in your refrigerator a day or two in advance. Before placing it in the microwave, drain any water that may have accumulated in the thawing process. One way to assist your microwave in the heating process is to cut your meat and vegetables to be of similar thickness. I would strongly advise against keeping whole chicken breasts or large slabs of meat in your containers. Before you store them away after cooking, slice your meats to around an inch thick. This will allow it to reheat quicker and retain flavor. Allow the meat to rest for at least 5 minutes after cooking before you slice it, it will preserve some of the juices. Sometimes you will find that rice becomes hard and grainy when it is refrigerated. I have found that covering the rice with sauce from the meal helps to prevent this. If your meal doesn’t contain any sauce, sprinkling some water over the rice before heating will help drastically. As with everything, practice makes perfect. The more you meal prep the more in tune you will become with different foods and how they act throughout the process. A lot of meal prepping is trial and error. I would suggest not doing any large scale prepping until you have tried the recipe and know that it has good flavor and will stand up in the fridge or freezer. Remember that the purpose of meal prepping is to save time, money, and to assist us with our nutrition goals. Take time to plan out your meals each time you prep so that you are giving yourself the best opportunity at success.